In 2012, Belfast signed up to become ‘Age-friendly’, in line with World Health Organisation guidelines which committed Belfast to encourage active ageing and enhance the quality of life for older people by optimising opportunities for health, participation and security. Following consultation with older and younger people across the city, it was clear that intergenerational work and taking an all age approach when needed is an important aspect in achieving our ambition of being an age-friendly city and as a result intergenerational work has been included in Belfast Age-friendly plan 2014 – 2017.The development of the Age-friendly Belfast toolkit and guide was a result of a lack of written guidance support available to groups and communities wanting to develop their own intergenerational practices. Partners involved in planning and implementing our resource included Belfast City Council Youth Forum, Greater Belfast Seniors Forum, Belfast Policing and Community Safety Partnership, Belfast City Council Community Services and Linking Generations Northern Ireland.Our Toolkit and guide offers organisations information and practical advice to effectively plan, implement and evaluate their own intergenerational projects. 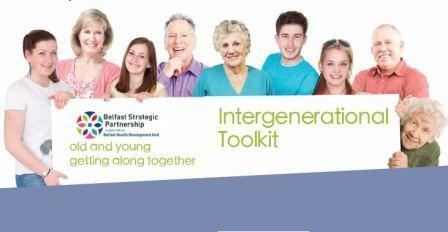 Belfast Age-friendly intergenerational toolkit and guide has been designed to be used by frontline staff, volunteers of younger and older people services and others working in similar roles. It enables you to establish the support you need to actively engage older and younger people in their communities promoting participation and a sense of belonging. Details on older people's involvement: In Belfast we have had an on-going relationship with older people promoting intergenerational practice. The Greater Belfast Seniors Forum who were consulted and inputted into our practice have over the past 4 years grown with us in our experiences of intergenerational working. They have joined us on projects, designed and developed new ways off working and incorporated young peoples perspectives in the development of our intergenerational resource that is useful for everyone. The intergenerational toolkit and guide has been welcomed by majority of individuals, communities and groups. A number of key partners have endorsed our resource. Some Quotes have included: ‘I really enjoyed the intergenerational work as it was an opportunity to meet with some of the older members of the city that I might not have had the chance to otherwise. I made some good friends while taking part and really came away with a better understanding of our older citizens. The development of an intergenerational toolkit and guide for Belfast is welcomed greatly. This will give local communities the confidence to join younger and older related issues together and build relationships as it has done for our forum.’'Over the past 2 years we have been involved as a forum promoting intergenerational practice. The work of the intergenerational group has been an eye opener for everyone who has taken part. It is great to experience new thoughts and ideas of young and old alike. The Greater Belfast Seniors Forum welcomes the development of the Age-friendly Belfast intergenerational toolkit and guide and would encourage other forums and groups to use it. 'Those who took part in our training were asked the following questions and gave the following feedback: Comments on training in general: • Very informative, sharing of practice and sharing experiences • I really enjoyed this training and found it to be interesting and knowledgeable• I have really enjoyed this training and I have been able to link in with other services• Training was varied and formant. Interesting and beneficial• The guide and toolkit are user friendly. Case studies were inspiring and really encouraging facilitators• The course was easy to understand and activities and exercises were enjoyable• Very Knowledgeable • All goodParticipants were asked if they have learned anything new as a result of the training. The following was provided,• Gave me good guidelines for different projects and how to plan properly. Explained properly what intergenerational work is.• Diversity of programmes and learning from successful programmes will inform my planning for dementia friendly communities’ intergenerational work.• Useful information on how to start a project.• Clarification on what intergenerational work best practice is and guidance on how to develop good practice projectsWhat topic did you find most applicable to your work? Why? Responses: • Practical ideas because we are interested in developing an intergenerational project • Perceptions of older and younger people• Ways to plan intergenerational programmes as it gave me a starting point for work• Intergenerational work on Anti-social behaviour• How to facilitate projectsFrom attendance at the seminar, participants felt they had:- increased your awareness of intergenerational practice - developed a better understanding of intergenerational practice and programmes - Received sufficient training to prepare you to undertake intergenerational projects They also added what additional items should be covered:• Additional training on work practice would be useful • Knowledge on how to take the first steps to start a project• I have a lot of one-time interaction with groups across all ages but not a lot of continuous interaction – I can use it but not in a specific project – but an approach to my day to day working. Out of all our participants we asked if they plan to undertake an intergenerational project in the future 98% have told us yes. We are hoping to contact the organisations involved in our intergenerational practice and evaluate whether or not progress has been made and learning as a result of organisations incorporating intergenerational practice into their work. This process on developing the Intergenerational toolkit and guide was very time consuming. There was a lot of research out there with regards to various definitions and funnelling down the information was quite difficult as all of it appeared to be relevant.